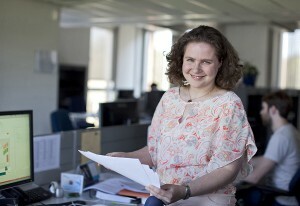 Carolien joined ICsense in 2007 following the completion of her PhD at the KU Leuven. Starting out as an analog designer, within a year she was given the early opportunity to lead her first project team. Carolien enjoys the organisational aspects of project leadership. Her life outside the office revolves around her young family of two daughters. In her spare time she loves to play music and dance. From a woman’s perspective, alas there are hardly any role models in this business. However, my interest in electronics was ignited by some exceptional professors I worked with at University. I was always interested in invention and I like to see ideas take shape before me. That combined with the support I had from my professors set my course in the design world. I have gained many interesting analog design experiences and insights since joining ICsense. I am currently focusing on power management implementations. These systems mainly use DC/DC switching techniques for elevated power conversion efficiency. That, combined with high voltage design, enables us to deliver more comprehensive, integrated solutions to our customers. When I started to consider my career, ICsense was a very obvious, local choice. I already knew a few people at the firm and saw an exciting and focussed small company with a lot to offer. I like to make things happen and ICsense allowed me to do just that. Also, I was pregnant with my second child at the time and ICsense provided me the flexibility to spend the time I needed with my growing family. The projects we take on are invariably challenging and thus, intellectually stimulating. We get to bench test our own designs, meaning I can see my projects through every development phase and gain real hands-on feedback. Also the team culture combined with the open door management style, means that things tend to move along at a quick pace. Project leadership requires that I take ownership for a project’s execution. I still have design responsibilities, but I also need to comprehend high level aspects of the project and to coordinate them. I am deeply involved in specifying the project with the customer from the start. I have to build execution plans, plans that guide the design and layout team (which usually consists of six people). Finally, I establish key project milestones to ensure we can measure progress and stay on track with the schedule. It’s a challenging role but a thoroughly enjoyable one.